it is clear that the overall integrated pressure on the top of the wing is less than the overall pressure at the bottom of a wing in order to produce a net nonzero lift force. Based on the attached figure below (AoA going from small to large), it seems that, for low and medium angles of attack, the pressure both at the top and bottom surfaces of the wing is lower than the free stream atmospheric pressure. The arrows' directions, from what I understand, are pressure gradients pointing toward higher pressure area, correct? When the angle of attack is sufficiently large, the pressure on the wing's bottom surface is higher than the free stream pressure (positive pressure coefficient)...Is that correct? Whenever the local pressure is lower than atmospheric pressure, I think air would rush to that area so air would be moving from far above the wing towards the wing top surface (same for bottom wing surface when the pressure coefficient is negative). Is that what happens? Thanks. Last question first. 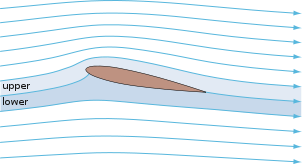 Yes, air does try to "rush" from high to low pressure, but the movement of the wing creates a condition where the net movement of the air relative to the wing will be downwards and backwards, and lower pressure remains above the wing. This is why airspeed is so important. Understanding the arrows in the diagrams is a bit like reading music or another language. They are simply pointing from lower to higher pressures. Isobars on the weather map show the same thing as pressure gradients. Also important is to know that you are looking at a fully symmetrical airfoil. There will be equally opposing lower pressure areas top and bottom at 0 angle of attack. This is why many airfoils have a flat or even concave bottom to help create higher pressure underneath the wing. But even a fully symmetrical airfoil will have a pressure differential as AoA increases. How to read representations of pressure around an airfoil? How to read the pressure diagram of an airfoil? What is the pressure on the pressure side in relation to the freestream? Why do delta wings generate less lift at a particular angle of attack compared to straight wings? Is pressure lower than ambient on the pressure (bottom) side of an airfoil?